Learning how to make a peppermint cheesecake recipe will satisfy you with the luscious refreshing taste of peppermint. It is beyond the wildest imagination of the early users of this herb in Roman times. Mint was grown in most of the gardens for many medicinal purposes such as an aid for digestion; it was dried and used in teas. The first known cultivation of this precious herb was known to be in London. When the colonists came to America, they brought starts of this herb with them to plant. The first were planted in Massachusetts where it was considered valuable for curing many ailments; not for cheesecake recipes especially the many savory cheesecake that developed from the herbs. From its early beginnings this herb has expanded into many of the foods we eat; learning how to make a peppermint cheesecake recipe is only a beginning of its many uses. The sweet peppermint sugar candy is probably one of the earliest recipes for the oil from this plant in the United States. This continues to be one of the most popular candies here. I know of many people who always keep this hard candy on hand. They use it for indigestion and many diabetics will pop a piece of this candy in their mouth if their sugar drops too low from taking their insulin. This is also my favorite at Christmas time when I make hard tack candy; when adding the oil to the hot syrup the vapors make the kitchen smell so delicious; along with the fragrance from my cranberry cheesecake and apple cinnamon cheesecake two favorites for Christmas time. When talking about mint candy, we cannot overlook the wonderful taste of peppermint patties with the creamy mint filling; these are so handy in some recipes when you learn how to make the peppermint cheesecake recipe. Then we have chocolates with mint flavoring in it. This has been one of my favorite combinations since I learned how to make cheesecakes; chocolate and mint. What about mint chocolate chip ice cream? This favorite flavored ice cream of many also is one of my favorite peppermint cheesecake recipes. Try some of the following recipes and see how delicious they are. This peppermint cheesecake recipe is made with mini chocolate chips. For the best distribution of the chips throughout the cheesecake, do not over soften or overbeat the cream cheese. Combine crumbs and butter; press firmly on bottom of 9 inch spring form pan or 9 X 13 inch pan. In large mixing bowl beat cream cheese on medium speed until fluffy. Gradually beat in sweetened condensed milk until smooth. Add eggs and peppermint; mix well. In small bowl toss ½ cup of the chocolate chips with flour to coat; stir into cheese mixture. Pour mixture into prepared; sprinkle remaining chocolate chips evenly over the top. Bake 1 hour or until center springs back when touched. Turn oven off and allow the peppermint cheesecake recipe to cool in oven with door slightly opened; chill. Just before serving remove sides of spring form pan; refrigerate until cold. This peppermint cheesecake recipe is very easy and delicious! Combine crumbs and butter; press firmly into 9 inch spring form pan. Beat cheese in large bowl on medium speed until fluffy. Gradually beat in sweetened condensed milk until smooth; add eggs and mix well. Divide batter in half (about 3 cups in each). Beat cocoa powder and vanilla into one half of batter; pour mixture into prepared pan. Stir liqueurs into remaining batter; spoon batter evenly over top of chocolate mixture. Bake for 1 hour and 10 minutes or until center is set. Turn oven off and allow cheesecake to set in oven with door slightly open for 1 hour. Remove from oven and cool thoroughly; remove side of spring form pan. 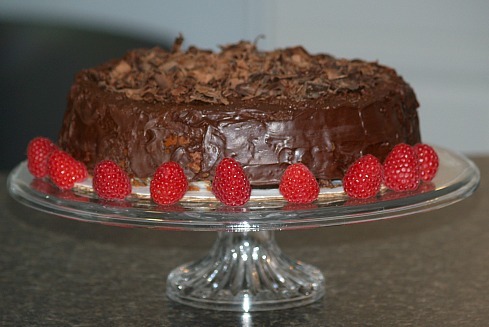 Spread top with chocolate glaze (recipe below). Melt 3 (1 ounce squares) semi sweet chocolate in small saucepan over low heat with 1/3 cup heavy cream. Cook and stir until thickened and smooth; immediately spread over cheesecake. NOTE: I used Creme de Menthe chocolate pieces melted in the glaze. I garnished with chocolate curls. The Creme De Menthe gives this peppermint cheesecake recipe a unique flavor. Combine wafers and melted butter; press into bottom and 2 inches up sides of 9 inch spring form pan. Beat cream cheese, sugar and crème de menthe until smooth in large mixing bowl. Add eggs all at once and beat on low just until blended; stir in sour cream. Pour filling into prepared pan; place pan on shallow baking pan on oven rack. Bake for 55 to 60 minutes or until center appears nearly set. Remove pan from baking pan; cool on wire rack for 15 minutes. Use small spatula to loosen crust from sides of pan; cool 30 minutes longer. Remove sides of pan; cool for 1 hour. Heat and stir chocolate in small saucepan over low heat just until melted. To serve spread over cheesecake; let set few minutes to set chocolate. This peppermint cheesecake recipes is a refreshing treat great for summer. Combine crumbs, sugar and melted butter; press in bottom and 1 inch up side of 9 inch spring form pan. Beat cream cheese until creamy; add condensed milk, crushed candy and food coloring; blend well. Fold in whipped cream; pour into prepared pan. Garnish with additional crushed candy; freeze until firm. Combine cookie crumbs, 2 tablespoons sugar and melted butter; press in bottom of 9 inch spring form pan. Bake 10 minutes; set aside. Melt chocolate morsels in small heavy saucepan over low heat stirring constantly; set aside. Beat cream cheese on medium speed until creamy; gradually beat in the 2/3 cup sugar. Stir in melted chocolate, vanilla and peppermint; pour into prepared pan. Remove from oven; gently run knife around edge of pan to release sides and cool completely. Gradually add marshmallow cream beating until stiff peaks form. Remove sides of pan from cheesecake; place on baking sheet. Carefully spread egg white mixture over top and sides of cheesecake. Bake in preheated oven at 350F degrees for 25 to 30 minutes or until golden. 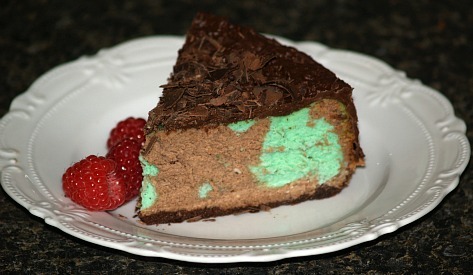 Try this peppermint cheesecake recipe with crème de menthe. Sprinkle crumbs over bottom of 8 inch spring form pan. Place cottage cheese in food processor container; process until smooth. Add cream cheese, sugar, cocoa, crème de menthe and vanilla. Process mixture until well combined; scrape down sides (It will be thick). Spread filling evenly in the prepared pan; place on baking sheet on shelf of oven. Bake 35 to 40 minutes until center appears to be set. Cool on rack 15 minutes; run a thin knife around edges of pan to loosen cheesecake from sides. Cool to room temperature then refrigerate until cold 5 to 6 hours. Remove sides of pan and serve with fruit if desired; serves 8. Try this peppermint cheesecake recipe with peppermint candy. TO MAKE CRUST combine and mix all ingredients. Press in bottom of 10 inch spring form pan; chill. TO MAKE FILLING place cream cheese, sour cream, sugar and flour in mixing bowl. Beat on medium speed of mixer until creamy; Add eggs beating after each. Stir in peppermint extract and crushed candy; pour into crust. Bake 50 to 60 minutes until center is set; cool on rack 10 minutes. TO MAKE TOPPING combine sour cream, sugar and vanilla in small bowl. Pour topping over warm cheesecake; cool completely. Refrigerate 8 hours before serving; garnish with crushed peppermint candy.